This deduction subtracts from your assessed value one-half of the property value or $12,480, whichever is less. How much this deduction can save you on your tax bill depends on several factors, such as your tax rate and your property's assessed value. Below are a few examples of tax bills in 2015 for a home assessed at $150,000 with and without the Over-65 Deduction. (These examples include the homestead deductions). The applicant and any joint tenants or tenants in common must reside in the home for at least one year before the deduction is claimed. The property's assessed value cannot exceed $182,430. The combined adjusted gross income (AGI) of the property owners cannot exceed $25,000. Applicants must be at least 65 in the year preceding the year in which the deduction is claimed. A surviving, un-remarried spouse who is at least 60 may qualify for the deduction if the late spouse was at least 65 and all other criteria are met. This tax cap limits the tax on qualified homesteads to no more than a 2% increase from last year. Note that this tax cap applies only to the homestead portion of the property. The adjusted gross income (AGI) cannot exceed $30,000 for an individual or $40,000 for married couples filing jointly. 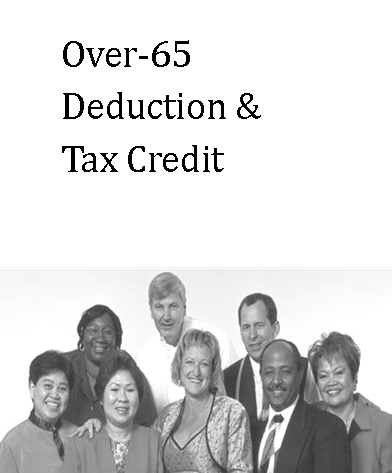 Q: Can I receive both the Over-65 Deduction and the Over-65 Tax Credit? A: Yes, as long as you meet all criteria. Q: Is my Over-65 deduction affected if my child is on the deed with me? A: The person applying for the deduction and any joint tenants or tenants in common other than a spouse must live in the home. The deduction is lowered by a fraction based on the number of owners (other than a spouse) younger than 65. For example: A father and his son are both on the deed and both live in the home. All criteria are met, except that the son is younger than 65. In this case, one-half of the deduction is allowed. Q: How do I determine my AGI? A: Look at your most recent federal income tax return. When you apply, be prepared to show the auditor's office a copy of your and any co-owners' tax returns. You might also want to pick up our flier, "Over-65 Deduction & Tax Credit," which has more information. This flier is available at the Porter County Auditor's office. Note: The information on this page is a general guide only and should not be construed as legal advice or as a final determination of one's eligibility for a deduction or tax credit. Additional restrictions may apply.